or buy Dentle One for 89 €. Dentle One gives you professional dental care for optimal dental health. Dentle One combines several features for effective, gentle cleansing of your teeth and gums. Swedish design and quality – so chic you’ll want to leave it out on display. The practical grip, modest weight and low noise level makes it extra comfortable to brush your teeth with. You can easily customize the toothbrush according to your needs with three different speed settings. Dentle One automatically indicates after 30, 60 and 90 seconds when it is time to brush in a new place. We trust in the quality of our products. That is why we offer everyone who subscribes to the Dentle toothbrush head scheme a lifetime guarantee on their Dentle One. If your Dentle One should stop working at any point during your subscription period – for whatever reason – simply return it to our guarantee centre. We will then send you a new one free of charge. We view this as one aspect of the simplicity which forms part of the Dentle One concept. With 8,000 oscillations per minute, Dentle One efficiently loosens plaque in hard-to-reach places, leaving your teeth visibly whiter. 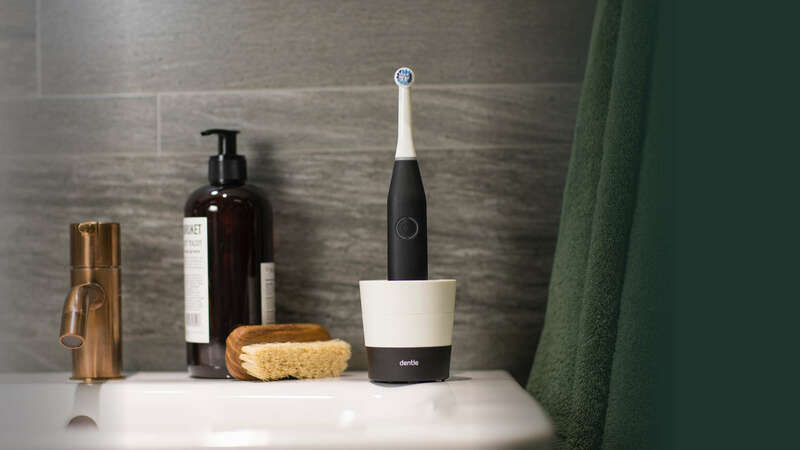 The timer function automatically switches off the toothbrush after two minutes and notifies you at 30, 60 and 90 seconds that it is time to brush in a new place. Our brush heads are soft to provide gentle cleaning on all surfaces of your teeth, combined with careful massage for your gums. Three different speed settings means personalized tooth-brushing. High speed for efficient polishing, low speed for extra gentle, and massage for massaging your gums. An oscillating toothbrush makes more drill movements per minute than a manual toothbrush does in a month. which helps to keep a fresh mouth and improve the health of the gums. Dentle One is a Swedish designed electric toothbrush that contributes to better dental health and whiter teeth. The name Dentle is a combination of the words Dental and Gentle. Dentle for dental and gentle for the effective and gentle cleaning.